last seen in Vancouver 2000. 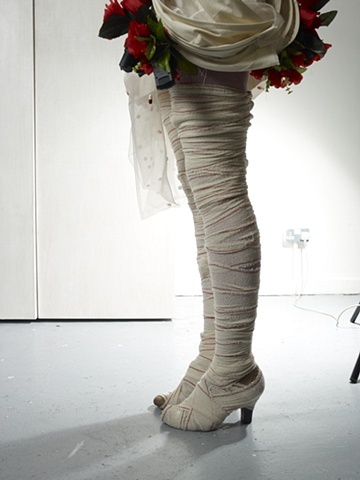 Created by Hannah Ashdown & Clare Payne, BA in Fashio,n Kingston University London. Materials used are led lights, artificial roses made from polyester fabric and gelatin, a simulacrum. Bandages for bandaged feet. Organza with pills, tablets and capsules made from analgesic paracetamol/acetaminophen to reduce pain and inflamation, shown to have beneficial synergistic effects by combatting pain at multiple sites of action. Cotton calico toiles to reproduce and copy patterns to disseminate her story. Johnson, who preferred English class and liked to write poetry, dropped out of school in Grade 9 at age 16 because she had to support herself, according to the relative. Soon after, she became pregnant when she was 17. She has a son and daughter whose names she had tattooed in a rose on her back."